Chess Edinburgh - Chandler Cornered - Who wants to be a Millionaire? Pawn McCartney singing...Hard Days Knight! So now what. I have no game to show. People have stopped sending them in. showing Bells games. Maybe later. I did get a postcard from Fritz. I can show you that. and sketch in lightly some of Plaskett's background. Harold James Plaskett, born in Dkeliha, Cyprus in 1960. Married to Fiona Pitt-Kethley an exotic poet, One child. What is an Exotic Poet? 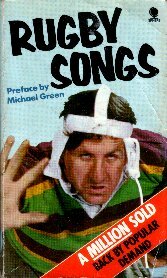 the verses for Rugby Songs. You know, Eskimo Nell, Gungerdin. etc. There is a dirty stinking toilet to north of Timbucktoo. There is another one for ladies further south. CENSORED and CENSORED CENSORED with CENSORED. So off I went in search of exotic poems by Fiona Pitt-Kethley. My party piece at The Oak and Bells is usually 'Wullie Wasell'. A Burns poem about an ugly woman or (if permitted) Gunger Din. the easily-shocked, or those without a sense of humour. the poems are nothing but a collection of words that don't rime. To make the poems 'hip' the occasional foul word is dropped in. Google her up and you will see her stuff. These alternative poets naff me off. the main alternative being they are not funny. ...and don't get me started on Picasso. (a messy sod). So thank God for Plaskett games. 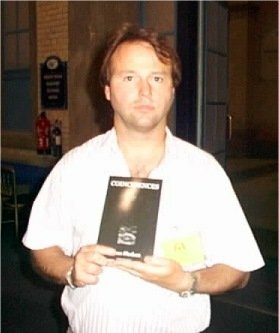 Here is Jim with a copy of his book about coincidences. So onto this weeks game. Plaskett games are usually interesting and worth playing over. Here is a very instructive example of a GM beating a good player. Andy Muir is a good player (though he has never been on the telly). Nice simple moves from white who does not fear a Queenless middlegame. it over the board? How many of us would have seen the idea? You will enjoy this. It was played in Blackpool, 1988. Here we see Jim in action as black in London, 1986. Black hangs onto a very dodgy looking gambit pawn. to get 'Morphied' and this will be over by move 25.
by simply putting his pieces on aggressive squares. and attack depending on how Black got his bits out. the kind of ideas found in any Reinfeld book. is always a little thought required. A classic lesson from Plaskett on how to defend gambit positions. Take the pawn and give it back at the correct time. it is white who does not make move 25. Play it over a couple of times so the ideas seep in. not play 3....e5 as traps are beneath them. I wonder if Jim Plaskett got any begging e-mails? 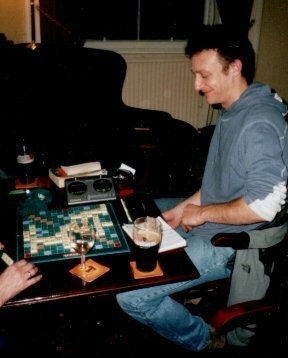 Here is a picture of Gerald Oswald playing Scrabble.